Husky, small, short, or tall. We have it all. Every Kennel & Crate includes stained interior, hinged doors, black hardware, and metal trimmed stained top. Your stain choice applies to the interior, top, and the secondary tone for any distressed or antiqued paint finish. If you choose a stain/poly or weathered wood finish, it will also be the exterior stain. Many other customized details are available - customized metal tops, picture frame tops, premium woods, door and panel configurations, flat back, custom paint and stain colors and custom sizes. Please let us know what customizations you are interested in here. Custom design your single extra large kennel today! We recommend this size for large breed dogs! We can expand them a bit to accommodate the Great Danes and Sheep dogs of the world too! 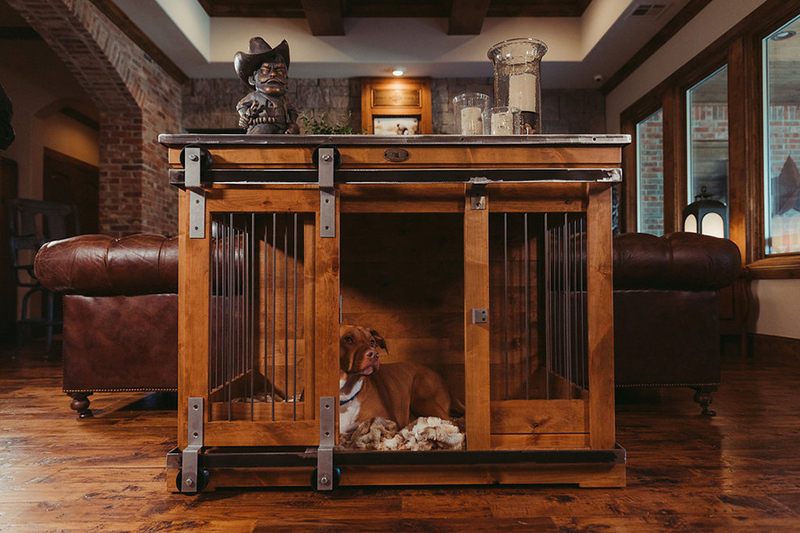 Kennel & Crate's double kennels feature an interior door that divides the space into two separate kennels or you have the option to latch it open to create one large den! Review our shipping information (standard flat rate drop shipping).